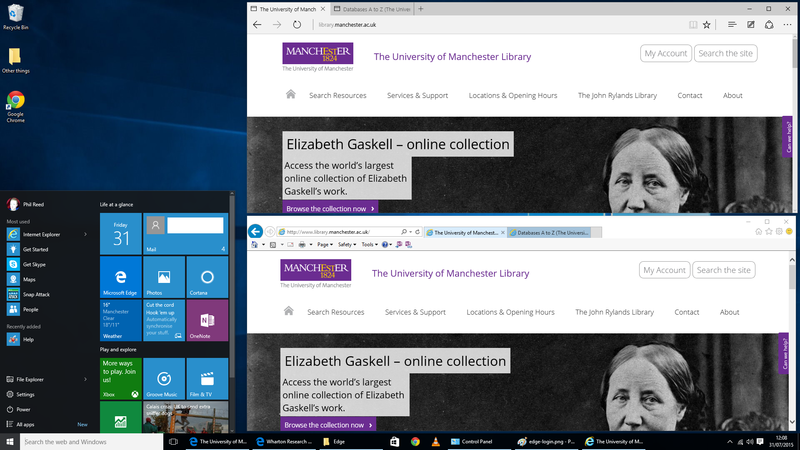 Last month saw the release of the latest version of Microsoft’s ubiquitous Office suite for Windows, named version 2016. It brings new features and a design more in line with that of versions of Office released for iOS and Android. 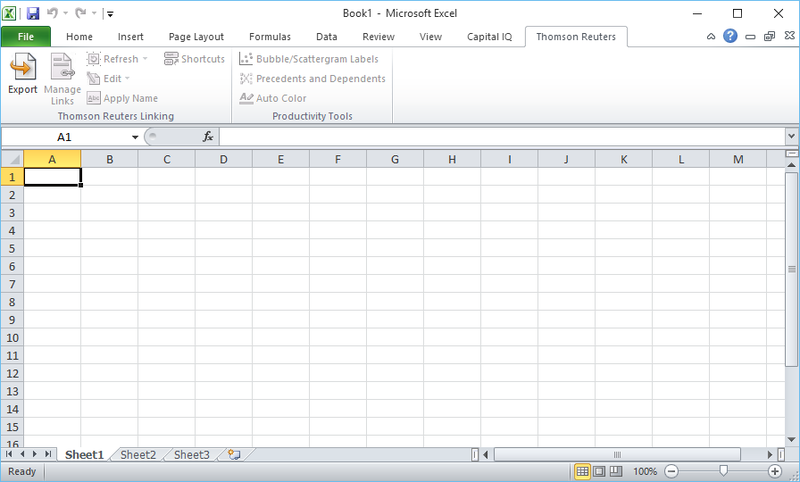 Many students beginning their studies this month will arrive at university with this version of Excel on their computers. This is not a concern for users of the most specialist financial databases at The University of Manchester Library as the databases are installed on cluster PCs which will remain on Windows 7 with Office 2010; it may become a matter of concern for those at other institutions who are responsible for PC updates in the coming months. 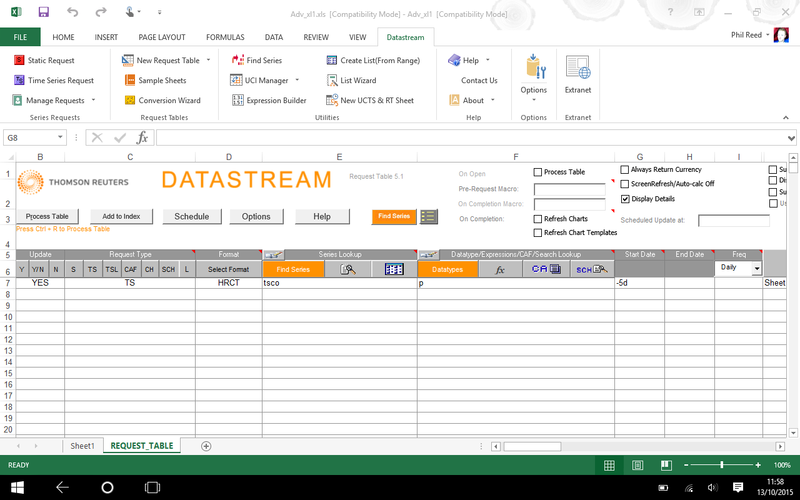 Datastream in Excel 2013: Although Office 2013 is not officially supported for DAO, I managed to install it on a Windows 10 32-bit tablet and got a Request Table to work. (Tip: save the Request Table document the first time it asks you to, otherwise you will get into trouble with macro-enabled filetypes later.) I have seen the previous version of DAO, designed for Office 2003, working with Office 2013 32-bit on Windows 8.1 64-bit (sorry, screen shot not available). Datastream in Excel 2016: Although Office 2016 is also not officially supported for DAO, I managed to install it on a Windows 7 32-bit PC and got a Request Table to work. I could not install it on a Windows 10 64-bit PC, using Office 2010 or Office 2016; it gave error messages such as “Compile error in hidden module: AFOHelp”. In summary: Datastream works for me in Office 2016 with Windows 7 32-bit and possibly in some other situations but more testing is required. 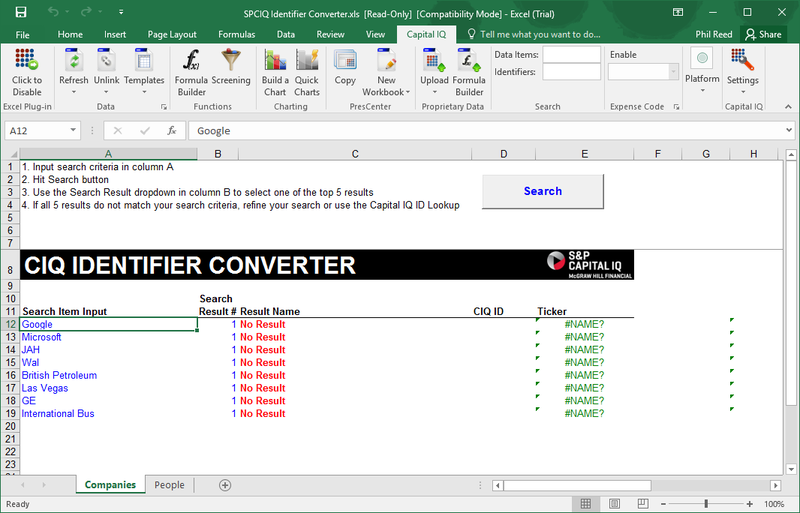 I had a mixed but unsuccessful experience using the Capital IQ Office Plug-in. On a Windows 10 PC where I had already installed the software to use with Office 2010, running the Excel add-in on Excel 2016 would let me load the Capital IQ ribbon tab, access the template library, but it would not download any real data. I tried the usual troubleshooting methods but could not get the data to work. When I tried to install Capital IQ Office Plug-in on Windows 7 where Office 2016 was installed, I got an error message that I could not work around: “Unsupported Office Version”. I guess Office 2016 is too far ahead of Office 2003 for it to recognise, even though I had Office 2010 installed as well. I have not tried to contact their help desk yet; perhaps there will be a newer version released to address this. I am hopeful for this with Capital IQ; there will not be an update for either of these Thomson Reuters products tested today. Unfortunately I was unable to run Thomson Reuters Spreadsheet Link (TRSL) in Office 2016. 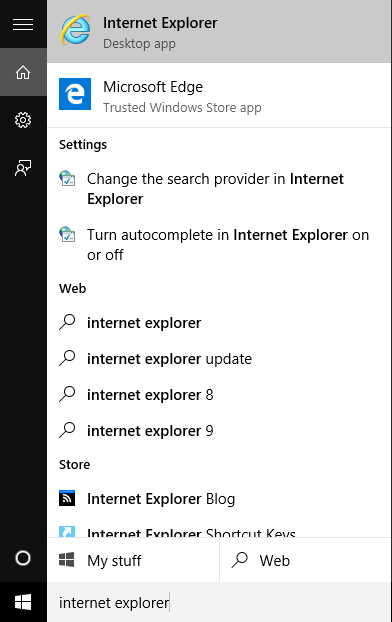 It is not officially supported in anything newer than Office 2010 so I was not expecting it to start working again in Office 2016, but running on the Windows 10 PC Office 2010 showed part of the Excel add-in loading; perhaps it had worked on that same PC a few months earlier. When I tried to install TRSL on a Windows 7 PC with Office 2016 installed, I got a message like with Capital IQ, stopping the installation from taking place at all. In short, it doesn’t work. 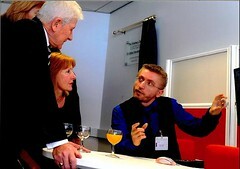 Many of the archive specialist database platforms that researchers use are dependent on old and ageing pieces of software. 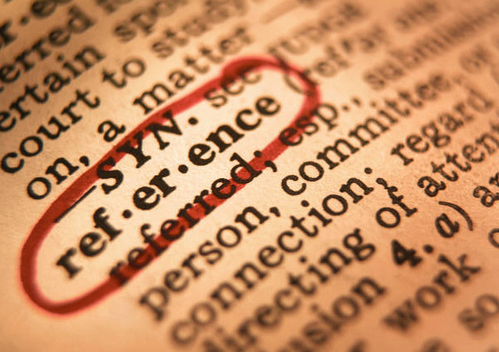 It is asking a lot to expect software written over five years ago to continue working in successive releases of the Windows operating system, and an even harder challenge to make it work within multiple Office environments on each of those platforms. Sometimes these old applications would require major redevelopment to work, sometimes just a tiny tweak. If that tiny tweak requires a disbanded team and development environment to be resurrected, it’s just as unlikely to be fixed as a major job. Sadly, the Thomson Reuters Excel add-ins fall into one of these categories. We will have to wait until Eikon is ready for wider use in education, hopefully before the Windows 7 operating system reaches the end of its life for receiving security updates in January 2020.